The stabilised growth of the urban population in western cities and the most recent economic crisis, coupled with concerns about the environment and land use, do not appear to have halted studies of housing, witness to periods of intense production from the early decades of the past century. While proceeding in a more controlled manner and based on objectives and strategies that differ from those of the past, experimentation with the theme of housing and its abilities to ‘make’ the city has not stopped. It now seeks new answers, driven by the social and political changes and emergencies underway. Epochal changes raise questions about the meanings of the home in a “liquid” and multi-ethnic society, and how it can represent them in the contemporary city. Paradoxically, despite globalisation, the continuous mobility of goods and people and the growing trend toward individualism, the home, in its new and multiple forms, appears to once again assume value as the measure of urban quality and a vehicle of social interactions. Today, setting out from the theme of the dwelling to respond to diversified habits, cultures and lifestyles, such as those present in today’s society, may constitute an opportunity for restoring meaning to the mosaic of heterogeneous and often unrelated elements that make up the city. Setting aside abstract theories and models, design research is faced with tough restrictions tied to themes of infill, substitution, building in and on the built, energy efficiency and environmental protection: a series of binding limitations, if we compare them to the numbers and occasions offered to architects during the golden ages of expansions from the Second World War until the 1980s, though in any case they possess the ability to stimulate more balanced experiments of equal effect. This still vital experimentation is the object of this issue of the magazine. 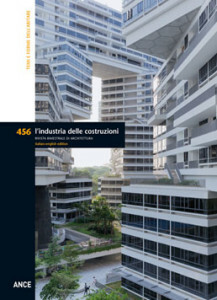 It is presented through a selection of important architectural projects that, while limited in number, are to be intended as representative of a vaster design research examining key issues tied to the dwelling and the city, lifestyles and social relations, and the feelings of the citizens of the third millennium. 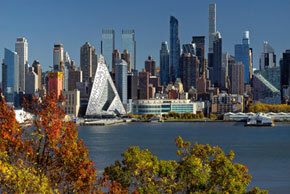 In Hell’s Kitchen (Manhattan), along the Hudson River, a few blocks from Central Park, Bjarke Ingels Group has completed a complex of 709 apartments that has already become a new landmark on the New York skyline. The project is part of city government’s wider strategy to rehabilitate abandoned riverfront industrial areas. The project aims to establish a new relationship with the city through typological innovation: VIA 57 West demonstrates how it is possible to innovate consolidated typologies, in this case the skyscraper, by hybridising it with models of settlement typical of European culture. The asymmetric trapezoidal skyscraper has been defined a “courtscraper”, a hybrid that successfully combines the density of a Manhattan skyscraper with the collective space of the European courtyard. A variable geometry and different materials create a building whose appearance changes depending upon the position from which it is observed and atmospheric conditions. 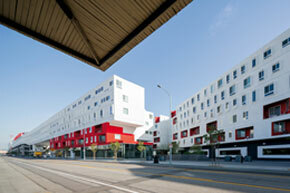 Situated in the McArthur Park district of Los Angeles – one the most densely inhabited in the city and with the highest number of homeless – The Six is a residential complex offering subsidised rental units to veterans and homeless.The name of the project plays with military jargon, evoking the famous phrase “I’ve got your six” (“I’m watching your back”). 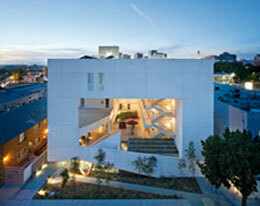 Precisely this creation of a new sense of community was the focus of the design by Brooks + Scarpa. Assistance to veterans who were unable to reinsert themselves in society is a widely debated public issue in the United States: veterans represent 3% of the Los Angeles population, though estimates put them at 11% of the homeless population. Seeking a spatial solution to a complex social challenge, the building develops around a large cavity that runs from the first floor to the roof. Common functions are concentrated on the ground floor: offices, support spaces for veterans and parking for cars and bicycles. Immediately above, a large semi-public courtyard is overlooked by 52 apartments on four floors, together with a common dining hall and laundry facilities. The project is part of the Hoche eco-neighbourhood, a four hectare site of quality construction with a particular focus on environmental impact, solutions for reducing energy use and the reuse of natural resources. The programme calls for the realisation of 635 subsidised dwelling units and the construction of a large urban park, a chapel, a school, a community centre and approximately 1,000 square meters of commercial areas disseminated across the site. The lot hosting the project by MaO and Tectône is situated in a band of transition between a largely residential area and another mixed development area. The architects developed the building in four autonomous blocks of varying heights, from six to fifteen meters, in an attempt to create a connection between the different fabrics surrounding the lot. The city of Ceuta is a Spanish enclave of approximately 50,000 inhabitants situated to the north of Morocco and one of the primary points of passage for migratory flows toward Europe. 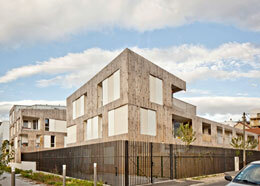 In the “Principe” district, one of the most difficult in all of Spain, the architects have completed an imposing social housing project. 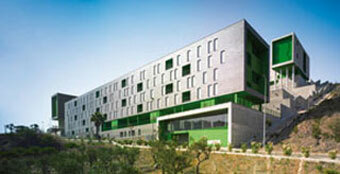 The new complex stands on the Colmenar Hill, alongside the Ceuta University Hospital. It pursues the objective of reconnecting the city’s divided populations, inserting an element that brings order to an area known for its informal settlements. In this frontier area facing the Strait of Gibraltar, home to different cultures and religions, the architects opted for a plan that would evoke a neighbourhood dimension, referring back to the concept of the neighbourhood unit and reinforcing a sense of community. In a city of sprawl and skyscrapers like Los Angeles, it is not difficult to recognise the unusual lines of the One Santa Fe complex, designed by Michael Maltzan with the objective of rehabilitating a former industrial area in the Art District. 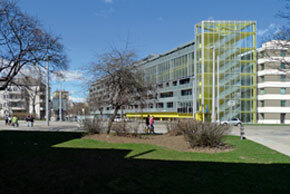 This building-infrastructure, approximately half a kilometre in length, is wedged into an in-between space framed by rail lands and traffic arteries, where it stimulates a process of re-stitching at the urban scale: while on the one hand it establishes a dialogue with the nearby river and railway, on the other hand it generates a unique urban backdrop and new spaces of social interaction. The complex consists of two long diverging bar buildings, connected by a central block, with a total floor area of 48,000 square meters on three levels. The programme of mixed functions includes shops, offices, bars and restaurants at street level, 438 rental apartments and spaces dedicated to wellbeing and free time on the upper levels. 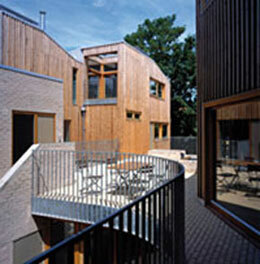 Situated in the district of Stoke Newington, to the north of the city of London, 1-6 Copper Lane is the first co-housing project in the British capital. Despite the fact that this theme has been debated in architecture for some time, co-housing remains a field of great interest though with few important completed projects. This building consist of six units grouped in six buildings based on the model of the cluster, held together by a podium that also includes the spaces of relation between the apartments. By concentrating the units at the centre of the lot, the layout allows for the creation of an ample perimeter garden, shared by all home owners. The presence of landscaping and the need to limit introspection and guarantee the proper balance between conviviality and privacy led the architects to orient the windows of the apartments for the most part toward the exterior and only a few toward the central courtyard. Four of the six apartments are three storeys in height and characterised by the extensive use of wood on the façades, while the remaining two are two storeys tall and built in masonry. The Zoia project dates back to 2008, when the City of Milan held a competition for eight sites it owned with the intention of favouring the design of social housing units. 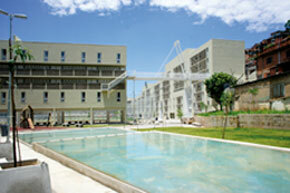 One of the project areas is situated in Via Fratelli Zoia, in the Quarto Cagnino district. 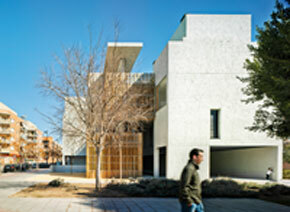 Here, in a fragmented urban context, characterised for the most part by isolated constructions, the three cooperatives awarded the project initiated a process of participatory design. The strategy adopted by the architects Vincenzo Gaglio and Luca Mangoni is clear: generating a lively and vibrant space by mixing public and private areas to create a centre of attraction that would restore meaning to an extremely rarefied context, characterised by the presence of large urban environments developed at the end of the 1960s and unable to generate a complete sense of urbanity. The urban development of Singapore has long been characterised by the incessant repetition of tall vertical towers, either standing alone or in groups. With the Interlace, OMA and Ole Scheeren propose a new model of settlement for the Asian megalopolis, reinterpreting the overused “tower” model, conceptually and spatially turning it on its side. On a 20-hectare rectangular lot, this building-city unfolds like a set of dominos. 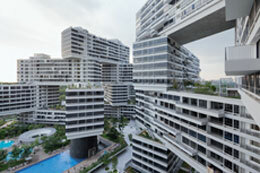 The 31 apartment blocks overlap one another based on a hexagonal pattern. The complex sits atop a landscaped plateau linked to a number of nearby urban parks. Functional mixité is limited to the ground floor, occupied by commercial spaces, offices, services and recreational and wellness facilities, such as pools and gyms. Viikinmäki is one of the new districts in the north-east periphery of Helsinki, alongside the Viikki area, known for its natural setting and as the home to four campuses of University of Helsinki. 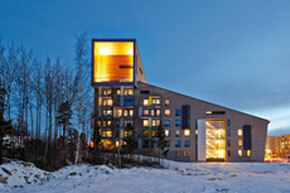 Situated on a rocky and steep terrain, it is crossed by the Vantaa River and numerous valleys. The largest of these, which divides the territory in half, is Maarianpuisto Park, the focus of an operation of building densification with largely residential and recreational functions. The plan included the construction of low residential buildings, situated on the steep slopes of the rocky hills, in a triangle defined by the road linking up with the centre of Helsinki and Maarianpuisto Park. 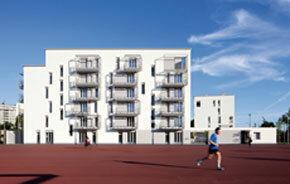 Just south of the Park is the centre of the entire operation, the Harjannetie Landmark Building, a social housing project that, as the name suggests, has become a symbol of the entire district. In the region of Guarapiranga, a protected area prone to flooding in São Paolo, Brazil, the architects Vigliecca & Associados were commissioned by local government to design the Novo Santo Amaro V. The project is part of the ZEIS 1 programme for special areas of social interest, and substitutes an informal fabric of illegal constructions. The scale of the project and the mixed programme of functions, which includes 200 apartments and community service spaces, make the project an example of residential infrastructure with a territorial role. The project pursues the objective of arresting social degradation and safeguarding the Guarapiranga and Billings watercourses against the pollution caused by illegal drainage. The project stands out for its radical approach: eight residential blocks are grafted onto an existing informal settlement, arranged along the contour lines of the site. This accentuates the topography and redefines the systems of interconnection with the neighbourhood. In the south-west part of Vienna, ARTEC Architekten have built a complex of 110 apartments and commercial spaces in the “Favoriten” tenth district. The city’s most populated area is home to many immigrants and considered an area with social difficulties. This triangular apartment block consists of two converging seven-storey bar buildings, occupying a total area of 2,337 square meters. In addition to residential spaces, 1,836 m2 are dedicated to community services and commercial spaces on the first floor and two underground parking levels.The connection at the ground, with its irregular geometric profile, determines an urban threshold that dialogues with the city. Ramps and stairs determine a visual link between the exterior and the light-filled space of the internal courtyard, which runs for the entire height of the building. The courtyard features with its opening on the north side functions as a space of connection between the apartments and as a climate control device. This project is located on a lot designated for subsidised public housing in an area marking the passage between the consolidated city of San Vincent del Raspeig and the university campus. Here, the team of architects led by Alfredo Payà decided to modify the typology foreseen by the local urban plan to develop a model of settlement that would allow a greater level of permeability. The design is based on a simple yet strong idea: transforming circulation into inhabited and vibrant space. To achieve this, the two longitudinal blocks of the master plan were offset, generating two diagonal points of access leading to a free ground floor plan, with a changing section that dilates and contracts space. The choice to provide only duplex units offers a twofold advantage: it eliminates the need for double distribution space and, by placing all of the entrances to the units on the upper level, allows for an increase in the height of the covered plaza.